Glyph's Studio USB 3.0 external hard drive provides your rig with pro-level protection and performance. The all new Studio USB 3.0 hard drive provides more than fast enough data transfer speeds for high-track-count recording sessions, high-def sample playback, and HD video editing. It even provides you with three high-speed connection options, including FireWire 800, eSATA, and USB 3.0, taking advantage of the latest technology, without shutting out older computers. From its phenomenally quiet operation to its stellar 3-year warranty, there's nothing not to like about a Glyph Studio USB 3.0 hard drive. Following over half a decade of wild success with their drives, Glyph set out to create a new industry standard with their Studio USB 3.0, and that meant doing more than meeting the old benchmark. For starters, Glyph designed the Studio USB 3.0 to be smaller and sleeker than its predecessors, saving you a bit of desktop space while still being rack mountable. At the same time, an intelligent, temperature-controlled quiet fan makes it perfect for recording in the control room. And since the whole thing is built around a 7,200rpm 64MB hard drive, you know you'll get the track counts and sample performance your music demands. It's really saying something when the slowest connection on the Studio USB 3.0 is FireWire 800. In fact, Glyph loaded this workhorse hard drive with three of the most important and useful computer connections out there: FireWire 800, eSATA, and USB 3.0. This gives you access to data transfer rates engineers only dreamed of in the past. What's more, both the FireWire and USB are backwards compatible, so you can connect your Studio USB 3.0 to just about any system you can get your hands on. As much as we hate to think about it, disaster strikes and, on occasion, hard drives fail. Let's hope that doesn't happen to you. 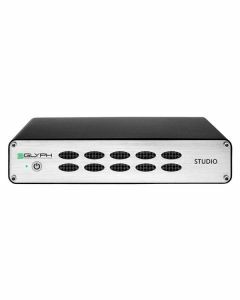 However, if your Studio USB 3.0 does break down in the first three years, Glyph has you totally covered. In fact, if it dies within two years, Glyph will even do what they can to rescue your data, and if it dies within a year, they'll even ship you a new drive in advance. And with failsafes in place such as exceptional ventilation and a hardwired drive health monitoring system, it's unlikely your Studio USB 3.0 will fail early or without sufficient warning.